Life Bake - Low-Carb, Grain-Free, GMO-Free, LCHF, Paleo, High-Fibre, Vegan. This is a Grain-Free, Low-Carb and Vegan Pizza Base. It is extremely low in carbohydrates at only 2g carb per base and is perfect for those following a low carb or “banting” lifestyle. All the ingredients are GMO free and does not contain any preservatives, colourants or flavourants. Simply add your favourite toppings and bake. 2 bases per pack. Ingredients: Golden Flax Seeds flour, Extra Virgin Olive oil, Psyllium Husk, Rock Salt. This is a versatile Low-Carb cracker which contains absolutely no grains. It is extremely low in carbohydrates at only 0.2g of carb per cracker and is perfect for those following a low carb or “banting” lifestyle. All the ingredients are GMO free and does not contain any preservatives, colourants or flavourants. Delicious topped with your favourite spread and eaten on the go. Can also be enjoyed with dips, as croutons in soups or crumbled into salads. Available in 4 delicious flavours: Rock Salt, Rosemary, Cumin and Chilli. Ingredients: Golden Flax Seeds, Sunflower Seeds, Pumpkin Seeds, Water, Psyllium Husk, Spices (Cumin/Rosemary/Chilli), Rock Salt. This is a Low-Carb bread which contains absolutely no grains. It is extremely low in carbohydrates at only 0.6g of carb per slice and is perfect for those following a low carb or “banting” lifestyle. Each slice has 5.2g protein and a whopping 14.4g of fibre. This is the perfect bread to prevent constipation on a low carb diet. All the ingredients are GMO free and does not contain any preservatives, colourants or flavourants. This bread is best when freshly frozen and popped straight into the toaster directly from the freezer. Delicious when well toasted. 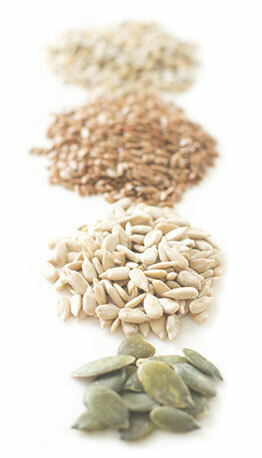 Ingredients: Golden and/or Brown Flax Seeds, Sunflower Seeds, Pumpkin Seeds, Water, Psyllium Husk, Rock Salt. This is a Low-Carb toast which contains absolutely no grains. It is a conveniently already toasted version of the grain-free bread listed above. It is extremely low in carbohydrates at only 0.6g of carb per slice and is perfect for those following a low carb or “banting” lifestyle. Each slice has 4.8g protein and a whopping 6.5g of fibre. This is the perfect toast to prevent constipation on a low carb diet. All the ingredients are GMO free and does not contain any preservatives, colourants or flavourants. This toast can be enjoyed as is, topped with a delicious filling of your choice and can also be used as croutons or crackers for soups, dips and salads. This is a Low-Carb granola which contains absolutely no grains. It is packed with delicious preservative free coconut shavings and non-irradiated cinnamon. It contains no added oil or artificial sweetener. It is extremely low in carbohydrates at only 1.3g of carb per 40g serving and is perfect for those following a low carb or “banting” lifestyle. Each 40g serving has 7.8g protein and a whopping 18.3g of fibre. This is the perfect granola to prevent constipation on a low carb diet. All the ingredients are GMO free and does not contain any preservatives, colourants or flavourants. Delicious served with full cream yoghurt or a dairy substitute and topped with nuts and berries. Ingredients: Golden and/or Brown Flax Seeds, Sunflower Seeds, Coconut Flakes, Pumpkin Seed, Water, Psyllium Husk, Cinnamon, Rock Salt.